The Bi-State Development Agency (BSDA) and the National Park Service (NPS) have signed renewed agreements for services and fee management relating to the development and operation of the Jefferson National Expansion Memorial which includes the Gateway Arch, Luther Ely Smith Square and the Old Courthouse. The renewal and signing of the agreements between Bi-State Development Agency and the National Park Service will allow Bi-State Development Agency to move forward with capital projects at the Gateway Arch such as raising an estimated $7.5 million in bonds for the replacement of the Arch tram system motor generator sets and rehabilitation of the service elevators. The signed agreements also mean that plans to redevelop the Jefferson National Expansion Memorial and St. Louis Riverfront can move forward. For the past several years, Bi-State Development Agency has been negotiating with the National Park Service to update the original 1962 agreement between the two agencies to reflect 50 years of changes in federal laws and regulations. The Bi-State Development Agency Board of Commissioners authorized its President and CEO John Nations to sign the agreements. And now, National Park Service Director Jonathan Jarvis has signed the agreements in Washington, D.C.
“I’m very pleased Bi-State Development Agency and the National Park Service have renewed their partnership, which is integral to ensuring the CityArchRiver 2015 project is on a path to success to expand and improve the Gateway Arch grounds. National parks are wonderful assets to help states attract visitors and grow jobs. And Bi-State Development Agency’s support is critical to the long-term viability and legacy of the Jefferson National Expansion Memorial and, as a result, the City of St. Louis,” said U.S. Senator Roy Blunt (Mo.). “This agreement is a huge step forward for CityArchRiver and important for the future of the Arch itself. It was not easy. So, I want to congratulate Bi-State Development Agency and the National Park Service for getting it done. Each day that goes by makes me more excited about the transformation that is happening on our riverfront. That is especially true today,” St. Louis Mayor Francis Slay said. In announcing the agreements, John Nations pointed to the long standing relationship between Bi-State Development Agency and the National Park Service that has greatly contributed to the St. Louis Riverfront and the bi-state region. “For more than 50 years,” Nations said, “Bi-State Development Agency has had a very successful and special partnership with the National Park Service. During the building of the Gateway Arch, we were asked to finance, construct, and operate the tram system. We accepted the challenge and financed construction of the tram system through the sale of $3.3 million in revenue bonds. We have been operating the trams to the top of the Gateway Arch since they went into service in 1967. 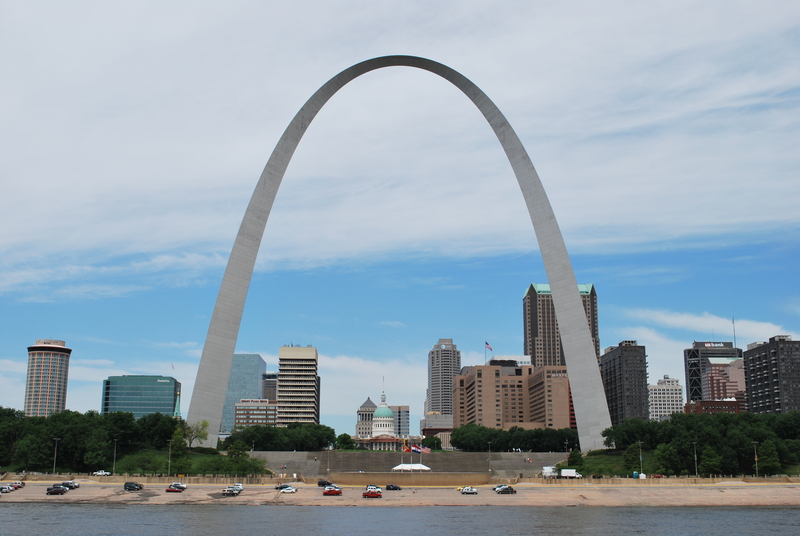 “We also run the ticket operations at the Arch and have financed renovations at the Gateway Arch over the years. In 1983, at the request of regional leaders, we issued $8.4 million in bonds for a 1,224 space parking facility to serve visitors to the Gateway Arch, Jefferson National Expansion Memorial and other riverfront attractions. The garage opened in 1986 and the bonds were paid off in December 2013. In addition, we provide marketing and public relations services for the Jefferson National Expansion Memorial.